Private 3 BR Cliff Hanging Retreat Minutes from Bigfork, Golf, Boating, & More. Amazing Cliff Hanging Retreat and Breathtaking Views at this totally "Decked" out Montana Home. This is a one of a kind property with a deck and view of the Flathead River, Flathead Lake and the Flathead Valley. Architecturally spectacular with central heat and air conditioning along with walls of windows. Recently improved the floors and bathrooms. The experience from inside, from the spectacular deck & from the property is truly a retreat for your mind and soul. It is one of the nicest places you can stay in Bigfork. Furnished with antiques, original artwork and pottery; high quality furnishings and luxury amenities. You are minutes from Eagle Bend Golf Course, the quaint town of Bigfork and have access to our private dock to enjoy boating and great swimming area right on the Flathead river as it enters Flathead Lake. The house is protected by security cameras. We have been visiting the Flathead Valley since discovering it in the summer of 1992. We enjoy both the summer activities and the winter skiing and outdoor fun. Honestly I am a little apprehensive about renting out our private getaway but we wanted to be a part of the sharing economy. This place is furnished with high quality comfortable furnishings accented with fine antiques, but its the breathtaking views that will keep you mesmerized. There is nothing else like this place available for such a value. Most places in the Flathead Valley dont have Air Conditioning, but this place has a brand new central ac system. This place has a brand new central heating / ac system. Eagle Bend is right near by 2 minutes away. Inviting Cliff Retreat in Bigfork! screen and we both want to thank the Valentino's for the new leather furniture....so comfortable. to the area in the years to come. Beautiful view of lake. Poor access for older guests. We love the location and the view is wonderful. There were 2 older folks and we had some serious issues with the outside access and a complete lack of any hand rails on any of the stairs. The exterior steps are concrete with rock slabs inbedded in them. They are rough, uneven and there is NO handrail on either side. If you enter from the garage, the stairs are quite steep and the bottom step is much higher than a typical ada step. Not a problem when you are going up the stairs, but a real surprise on the way down, again NO handrails. The shower in the master bedroom. It is built into a 1970's bathtub. Again when you step in it is not an issue, but stepping out of the tub there is an excessive drop, the first time out, I fell and fortunately there was a wall by the toilet that I was able to grab. No hand rails up to the bedrooms. There was no heat in the kitchen dining and living room. The heat only seemed to work in the bedrooms. However there was a great fireplace. There was plenty of nice, dry wood in the shed across the driveway and a wheelbarrow to move it with. I guess that they are planning on paving the driveway because it was very fine gravel. The house did not come with a key for entry. We called when we were on our way to get the code to the garage and they had left the interior door to the main level unlocked. That was ok.
We are from Los Angeles and compulsive door lockers!!! That was fine until we got back from the grocery store to discover that we were locked out. It took repeated calls to the owner to finally get another code to a keybox on another door. It never occurred to me to insist on a key for the unit. Big Fork and Whitefish are both lovely places to visit, very charming, friendly with lots of things for all. Knowing what we now know, we would only recommend it to younger folks. This is a very interesting review and I thank Maurice for taking the time to write such a thorough review. As noted by the listing title - the house is built into a rock ledge, and it is perched on a cliff. There are tradeoffs having an older home but enjoying one of the best views and locations around Flathead Lake. Special care must be given when walking around the property or up on the higher cliff away from the home where there are no railings. It's Montana! With all of its splendor comes some risks. Unfortunately, the home is not ideal for children or the disabled. However, the previous owners lived in the house into their 90's, and we installed a wheel chair ramp on the rear and most of the home is on one level including a bedroom and bath. Regarding the lock and key - yes it is true our home is accessed through the garage and that the interior door to the house is typically left unlocked, however we do have a lockbox with a key. We also have a hidden key on the property grounds. It does get cold in Montana - especially in the winter and the home features a full size wall of windows. Looking out the windows over the cliff covered with ice and snow does look chilly, but we installed a new Carrier furnace in 2014. This is a top of the line new central heating and air conditioning system. We redid all the ductwork to try and better balance the temperatures room to room, but with the huge full size windows it can be a little cool in the winter and warm in the summer especially around the edges of the glass window areas. The bathrooms are outdated and we plan to update them in the spring. However, they are clean and spacious each with a new commode, sink, hardware and pleasant high end bath towels, throw rugs, shower curtains and heaters. Good suggestion regarding interior railings and we intend to get that done as soon as practical. The main living areas are all on the one floor only two of the bedrooms are up a single flight of stairs. Cliff Hanging Retreat was all that we hoped it would be. It was perfect for our three-generational family of five (1 child, 2 parents and 2 grandparents). We instantly felt at home with the healthy snacks the owners had left in the kitchen to greet us. They were a particular treat since we weren't able to get to the grocery store right away. The kitchen is well-stocked. The home is cozy, very clean and very neat and tidy. 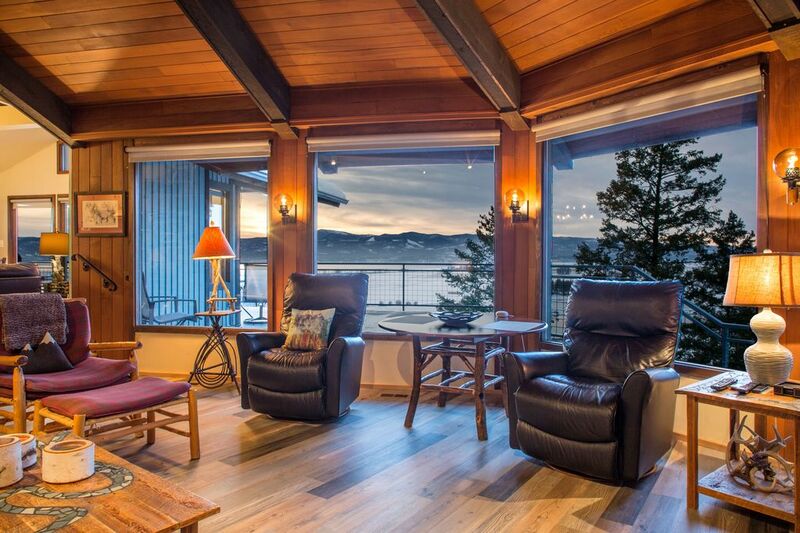 The architecture is intriguing, but most impressive of all is the stunning view of Flathead River and Flathead Lake seen out the many windows and from the large deck. It happened to rain during most of our stay, which is very rare for this area, but that did not in any way diminish the view or the comfort we felt. The owners were very helpful and responsive. We would love to stay in their home again if we return to Bigfork. This place will not disappoint you. The view from the cliff out over the lake, river and valley is truly spectacular. A big deck and many windows let you enjoy it. Even though it is indeed on a cliff, there is no scary driving or walking to get there. The house is in a nice, quiet area of Bigfork. The lot is large and secluded. The home is older, probably built in early 70s and well maintained. The floor plan is open and comfortable. The kitchen is well stocked. The beds are comfortable. The TV is HUGE and works well. The owners were extremely helpful and easily accessible. We would definitely stay again if the opportunity arose.